Buy George, He's Got It! Tonight, Tuesday, I'll be joining Hannity on Fox News to discuss the latest revelations re designated President-in-Waiting Hillary Clinton. Hope you can tune in - 10pm Eastern/7pm Pacific. Only under the peculiarities of America's mainstream media could you have an interviewer interviewing a man who has written a book disclosing the dodgy donations to the Clinton Foundation without the interviewer disclosing that he himself is a donor to the foundation. For example, in his on air apology for this ethical mess, Stephanopoulos did not disclose that in 2006 he was a featured attendee and panel moderator at the annual meeting of the Clinton Global Initiative (CGI). He did not disclose that in 2007, he was a featured attendee at the CGI annual meeting, a gathering also attended by several individuals I report on in Clinton Cash, including mega Clinton Foundation donors Lucas Lundin, Frank Giustra, Frank Holmes, and Carlos Slim — individuals whose involvement with the Clintons I assumed he had invited me on his program to discuss. 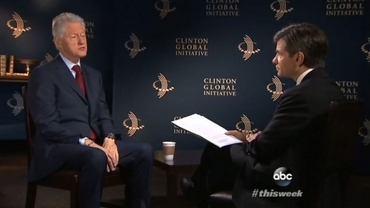 Stephanopoulos did not disclose that he was a 2008 panelist at the CGI annual meeting which, once again, featured individuals I report on in the book, such as billionaire Clinton Foundation foreign donor Denis O'Brien. ABC's most visible news employee did not disclose that in 2009, he served as a panel moderator at CGI's annual meeting, nor did he disclose that in 2010 and 2011, he was an official CGI member. Stephanopoulos did not disclose that in 2013 and 2014, he and Chelsea Clinton served as CGI contest judges for awards, in part, underwritten by Laureate International Universities — a for-profit education company I report on in the book. Bill Clinton was on its payroll until his recent resignation. Seventy-five grand in "donations" is nothing to Stephanopoulos. But the amount of time he has given the Clintons is far more valuable: He is lending them his reputation, and giving them his endorsement. He was a "member" of the Clinton Global Initiative - whatever that means, but let's take it at face value: it's equivalent to being a member of the Girl Scouts or the Elks or the Ladies' Aid Society or the Ku Klux Klan. How could neither he nor ABC not think this was something to be "disclosed"? Or, indeed, a disqualifying factor from conducting the interview in the first place? And that's before you consider the ludicrous thrust of Stephanopoulos' interview: We can't trust Peter Schweizer on the Clintons because he worked for Bush for four months, says a man who's worked for the Clintons since he was in Third Grade. Karl Rove is hired as an anchorman by ABC News. Whoa, you can stop right there. We're already in the realm of the fantastical, even though it is, objectively, exactly the same as hiring Stephanopoulos. But Rove says not to worry, my partisan days are behind me. I'm strictly Mister Even-Handed Newsman now. And then he spends ten years as a high-profile pitchman for the George W and Jeb Bush Foundation. And, when he interviews some guy who's written a book on all the dodgy donations to the Jeb Bush Foundation, he doesn't mention that he's a member of it. The only interesting question is whether ABC knew about all this, and colluded with Stephanopoulos in perpetrating a fraud on their audience. As for Stephanopoulos' regret that he didn't go "the extra mile" in disclosure, the loyal Clinton flunkey didn't go the initial inch-and-a-half. At the very least, he should be dropped from all election coverage between now and November 2016. There's plenty of other stuff he could do - Kim'n' Kanye, Bruce transitioning - where his faithful service to his longtime benefactors is of less obvious advantage. Not to be a total nerd or anything but Kirby pretty much gave the world Thanos the new Avengers villain by accident over at DC. He made the villain Darkseid and the whole New Gods goofiness that pretty much has hijacked DC ever since. Marvel knowing that they had some real competition came up with Thanos who is basically Darkseid with a more fabulous fashion sense (everything at Marvel has always seemed a little more Batman-and-Robin than it should). He even went back to Marvel later and was the first guy to come up with The Falcon and Black Panther, which are of course Disney/Marvel's new big out when it comes to them trying to avoid being called out for trying to push the whole white cisgendered liberal male paradigm. They just somehow have to convince the enterprising sorta-young-by-director-standards minorities who made Selma and Dope to jump in on it. You know they can't really be typical Leftist racial bigots got some minorities in there to help them out. It's the ultimate in white-guy I-got-a black-friend cred. Their black friend is totally super. So yeah, Jack was so much more than Stan Lee's Dean Martin to Jerry Lewis. On that last point, I meant to say something a few months back when Archie (of all people) took a bullet for his gay best friend. Turning Green Lantern gay (or Green Arrow - I can never remember) and Superman anti-American and making Spider-Man black and Robin the Boy Wonder trans and Dr Strange Muslim is what the left in other circumstances would call "cultural appropriation". If these guys were to create Gay Lantern or Trans-Girl from scratch, nobody would care. Their only value is as established cultural icons from the pre-identity-group era, and their enforced conscription to the cause is an act of cultural vandalism. ~As you know, Climate Change: The Facts features me and some of the world's most eminent scientists on the state of the climate debate as the global-warming "pause" prepares to enter its third decade. It's a brisk seller, and alas, as fast as it comes in at Amazon, it sells out again. So don't forget you can always order it direct from the SteynOnline bookstore, and I'll be happy to autograph it for you. Or, if you're really in a hurry, it can be yours within seconds via Kindle, Nook at Barnes & Noble, or Kobo at Indigo-Chapters in Canada and around the world. And don't forget on June 11th and 12th, you can join me and my co-authors Anthony Watts, Willie Soon, Bob Carter and Alan Moran in Washington, DC for the Heartland Institute's 10th International Conference on Climate Change. For more information on the conference, see here.